Are you so afraid of your moles that you no longer can look at them, for fear of what you might see? This wonder of technology will give you great peace of mind. I not only have written about this technology before (having interviewed two physicians), but I’ve had this procedure done and will continue having it done. Moles are photographed, then examined on the computer screen under high magnification by the dermatologist. Not only that, but the computer database compares the image to data from melanoma and then comes up with a rating. The rating can be a number or color. 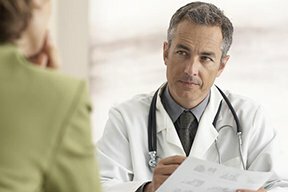 The computer does NOT diagnose melanoma, but it indicates that a mole is suspicious or has characteristics that resemble melanoma more than it resembles a benign lesion. Based on the rating, the doctor will then decide on further action (or not). 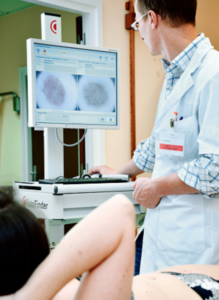 Serial digital dermoscopy is done yearly, every 18 months or even every two years (depending on the doctor’s recommendations, though you can have it done as often as you’d like). The same moles are photographed, and the computer program compares new photos to previous images and will detect changes — earlier than a dermatologist possibly can, even with their handheld dermoscope. Map out your lesions at home, using a large sketch book. Even if your drawings of various body parts are crude, at least this way you’ll have an idea of where you have moles, so that you will know if new ones have appeared. This will reduce a lot of anxiety. If you can illustrate, then draw and render your moles; this will significantly reduce anxiety. I’ve done this (I can illustrate shape and texture, plus draw scaled-up images; I knew someday this skill would come in handy). Many artists may not think to do this. Whip out your favorite illustrating tool and draw your moles, capturing variations in color, patterns, texture, border, etc. Then, when it’s time to do monthly self-exams, you’ll have a better chance of detecting a change. Commit to a self-skin exam every month without fail. This way you won’t wonder, “When did this mole begin changing?” or, “Did this mole look this way only a few weeks ago?” The monthly will cut a lot of anxiety. Have a dermatologist examine your skin from head to toe, and make sure they use a dermoscope. This will lower anxiety. Better yet, have the doctor look you over twice a year. Know that only 30 percent of melanomas arise in pre-existing moles (Yale School of Medicine). Next, to reduce mole anxiety, you can consider getting an application for your smartphone that works in a similar way to digital serial dermoscopy. This type of app is new, but it does NOT replace the type of digital serial dermoscopy that I described previously. Consider it an adjunct to your skin health surveillance program. Finally, to rid yourself of mole anxiety, have the spot removed and biopsied. Don’t put this off. Just get it done. Depending on your insurance plan, you won’t have to pay for this other than the copay. As for the annual or biannual screening exams, your insurance probably won’t cover this, but think of the investment as part of your overall beauty and health indulgences. How much money have you spent in the past 12 months on the following: manicures, pedicures, facials, hair extensions, belts and shoes you didn’t need, etc.? The digital dermoscopy I use costs $250 (includes screening exam). This is about the cost of one manicure a month for a year, which many women don’t think twice about spending money on. You may need to make a trade-off if the funds aren’t there. However, if you want to get rid of mole anxiety as much a possible, the money spent to do this will be well worth it. Can’t Stop Anxiety over Your Moles? 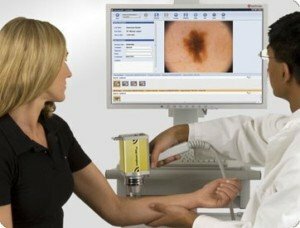 Can’t See the Moles on Your Back During Skin Checks?